Mass Street Music is a small, independent music store located in the heart of Lawrence, Kansas. For over 35 years, Mass Street Music has established a reputations as a top quality resource for musicians to find great gear and get exceptional repair work done. In addition to setups, repair, restoration, modifications and custom work, MSM now offer a full Plek service, and are inviting their customers to "Come and meet the Plek!" 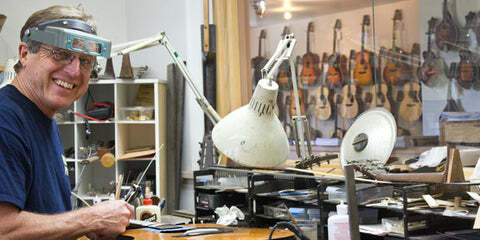 "Many of our favorite builders have been utilizing the Plek machine in one way our another for years, and we're proud to bring that level of accuracy and service to our Mass Street Music customer....One of the more gratifying parts of having a Plek in the shop was to reaffirm that our luthiers were already doing Plek quality work. We loaded up the machine with instruments the crew had done hand fret work on and after a scan all of them achieved Plek quality results according to the software. What the Plek does bring to our workflow is its capabilities as the most powerful diagnostic tool we've had for determining the shape, and condition of a fingerboard and frets, before and after any work has been done." Find out more about the great work being done by Jim and his team here.